I’m a big fan of just pressing the Print Screen button or Alt+Print Screen (to get the active window) and just sending the screenshot to your clipboard. Next just open up Paint or Photoshop and paste the image in there. Crop, highlight, do whatever you need to do and then save it. It’s a pretty simple process, but that would require a license for Photoshop for each machine (costly) and what if you want to do more than what Paint allows easily? I would recommend that you check out the program HardCopy. It’s a freeware application available here. Basically HardCopy fills the gap between the bare bones Paint and the Vegas-or-bust Adobe Photoshop. It also includes some particularly cool features when it comes to taking screenshots. How about that? A program that does one thing, but does it well. Those are the types of applications that typically catch my eye as deserving special mention. Since it’s a freeware app, I’d mostly just recommend that you download it and start checking it out. Maybe you need more of a sales pitch and I’m fine with that because HardCopy offers some features that are really worth mentioning. I discussed one already in the previous post in using HardCopy to print correctly to non-standard printers. 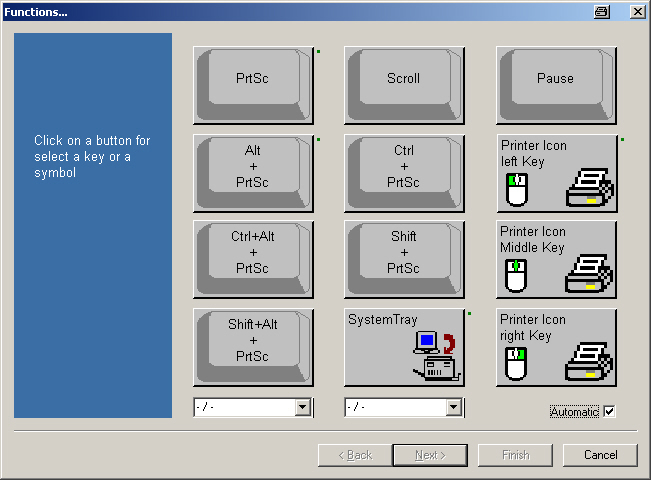 Simply set up one of the buttons, like Ctrl+Print Screen, through Functions… and specify the printer. Along with that, HardCopy allows a whole lot more configuration. You can set up HardCopy to behave differently for different keys very easily. You could have one automatically print landscape, one print portrait, one save the files to a certain folder, another to a different folder, one to open the HardCopy window so you can edit the picture, and a lot more. It’s customization is really where it’s at and it allows you to simplify the usually tedious tasks involved with screenshots and making tutorials. At the bottom of the HardCopy page, it says it is the Freeware version, but it acts more like a shareware version. After about 300 startups, it will start popping up a note every time asking that you register the program. You can modify the registry key that keeps track of this number just to keep it at a lower number. I’m all for registering and donating to the author of such a versatile program, but I’m even more for not being annoyed by said program. You can use the following line in a login script to write to the registry and keep that number low. If you want to set up a default configuration for HardCopy for multiple users, simply configure the program to your specifications and then go that registry location above and export the Settings key. Say that you exported it to c:hardcopy.reg, you could create a batch file to run at login with this line to import these settings. Because of its versatility, ease of use, and ability to be customized even down to the registry settings I recommend using HardCopy even if you find the Print Screen -> Paint process easy enough. Basically it can just save a few steps and it wraps everything up into one convenient interface that offers more functionality than Paint and doesn’t cost the license of Photoshop. *Edit the registry at your own risk. You should have no complications if you follow my steps, but the author takes no responsibility for loss of data, time, or sanity caused by this, past, or future postings. Always make a backup before you do anything stupid.